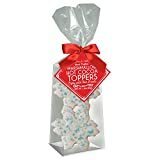 This winter, as the snow falls outside, warm up inside with one of these cool new Huge Snowflake Marshmallows floating on top of your steaming cup of hot cocoa. 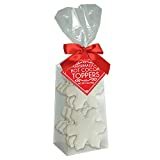 This set of six large snowflake-shaped gourmet marshmallows are handmade with a dash of tasty Tahitian vanilla. They're also great for roasting over an open fire along with the chestnuts or making festive, wintry s'mores.